I would by these labels again. I have used this product in the past and find them quite handy. The black print on the clear label easily stands out on any color envelope. I would recommend to a friend. Loved my labels. Ordering More! With these labels I like to be able to quickly mail payments of a stack of envelopes without all the repeat writing of my address. I use the little bow it comes in as a dispenser. Moved to a new house and wanted to have the same address labels for all out going mail. Wanted it to look more business like and these labels provided that for me. 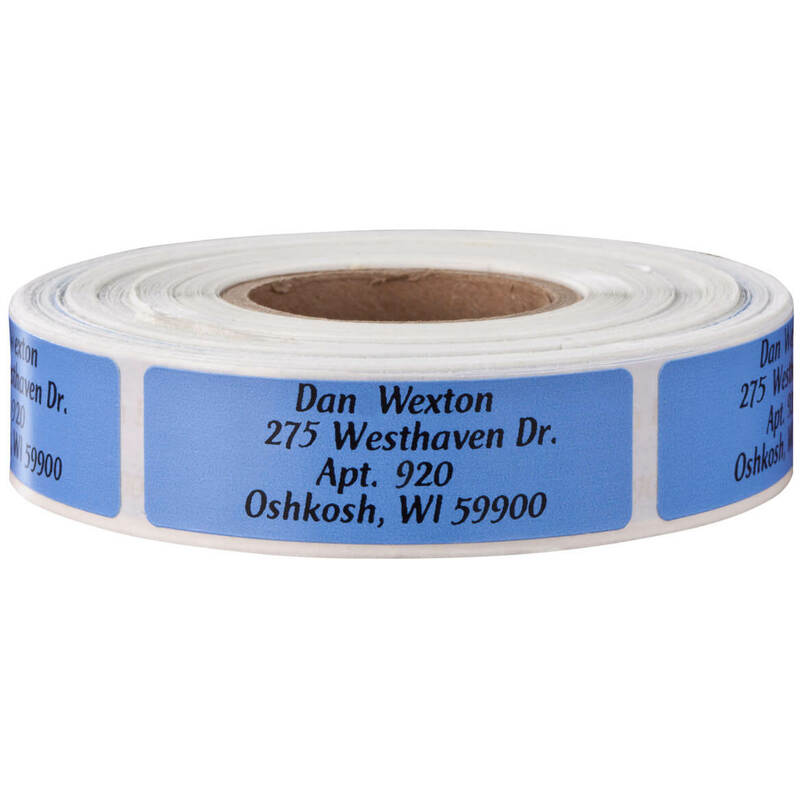 The address labels are great for business or personal use. They are a good value for the price. My order was processed and shipped quickly. The size of the labels is good, and the price is quite nice. I wish these labels were available with a letter monogram but they are still worth buying. Would definitely order these again, and recommend them to a friend. I will buy other items from Miles K.
I received the labels today and they are very nice and print is thick so as to show up on the clear tape. I am very satisfied with the style print and I find that they are better than the ones I ordered years ago that the style print was small and was hard to read. Great quality. Very pleased with printing, also. QUICK WAY TO PREPARE MAIL. I was pleasantly surprised how nice the address labels looked on my envelopes. Perfect! Great to leave on mailing lists, notes, etc. Have always had good experiences with this company. Highly recommend it. I don't like labels with lots of stuff on them. These look very nice and professional. Good quality. I like the fact that these are see through so pretty stationery or envelope shows. Well, labels are labels after all, but this is the fourth time I've ordered from Miles Kimball and I haven't been disappointed yet. Good quality, [...] and NO problems! So useful when doing a big mailing! Clear address labels won't cover where return address label is. Looks very nice on colored envelopes. Great address labels for my family. They are a nice size and came in quickly. Got what I wanted, fast, from Wisconsin. I ordered 250 labels to put on my high school class reunion pens and flashlights. The price was perfect, quality was perfect, and I enjoyed doing business with a Wisconsin company that has a phone number and people that can answer your questions. Love the clear labels, and the size is perfect. I love this label - clear and looks good on any envelope. Could not be happier. These look very nice on any envelope or package. Name, Address, shows well with clear Labels. I ordered these to use for my husbands business. Last year we changed from a physical address to a post office box, so all the old address labels we have are no longer valid. I ordered the clear so that the return address would be easier to read against envelope. They peel from the strip quick and easy. These are perfect labels - love the clear background! Perfect..just as I had ordered!! My daughter is graduating.These will be her return address labels. These labels save a lot of time. Easy to peel off and use for all my mailing needs. These labels perfect for our use. I loved my address labels! I am happy with my labels. Exactly what I wanted, simple and professional! Great deal for personal every day use. Showed them to my friend, and she plans to order them also. She is ordering some of the Christmas labels also. They are very crisp and clear, easy to read. THANKS for a great product. The transparency makes it so that only the words show-color of the envelope shows through. great product,well worth the price ! 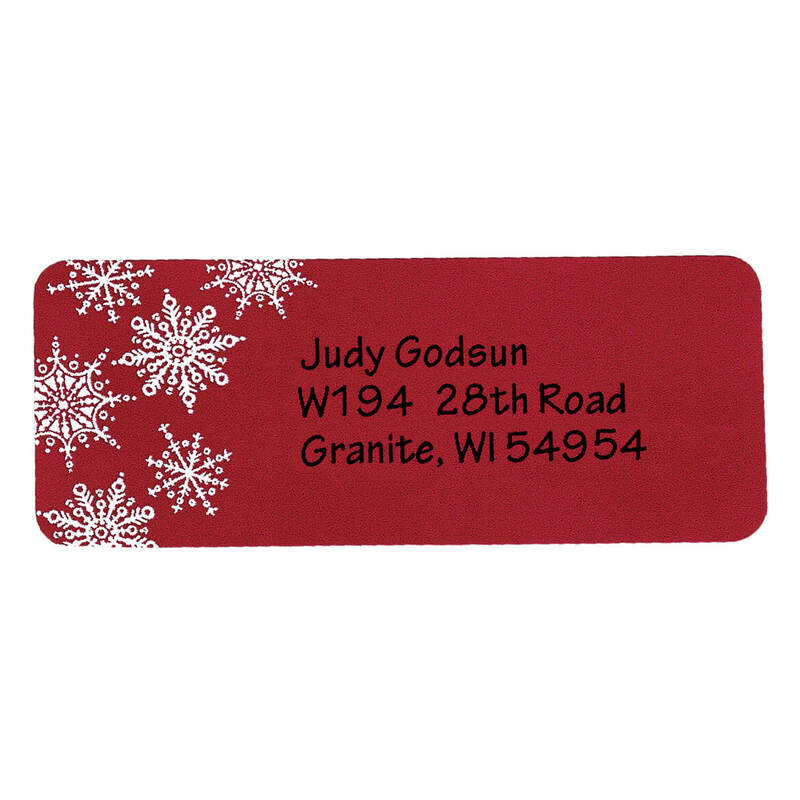 I use these address labels for my personal use in mailing letters and bills. Very easy and economical. We get tired of writing the address on envelopes - so this makes our life totally easy and efficient. Labels are clear and no trouble in reading them. 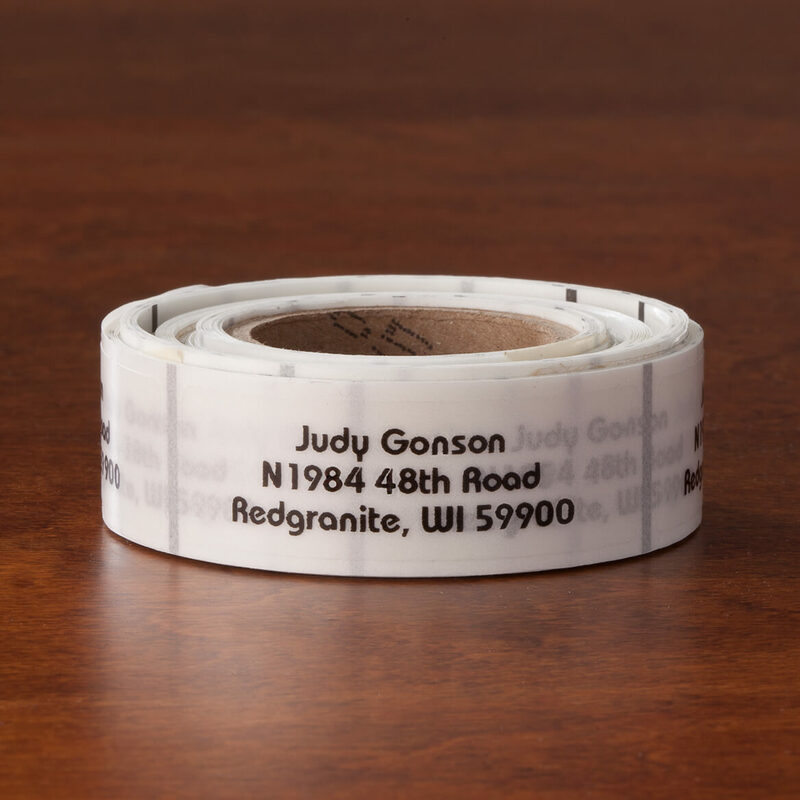 Just love these clear address labels! They look professional and will be wonderful on colored envelopes! Would recommend others trying these. You will not be disappointed!! the ones you see elsewhere but for 1/2 the price! I used these labels as the return address on my daughter's bridal shower invitations. Because they are clear, they give the appearance of being printed onto the envelopes without the cost of paying for professional printing, which I felt was unnecessary on a bridal shower invitation. I was very pleased with the look. When my daughter was moving to a new apartment, with thow new roommates, I ordered three sets of these, one for each! It was a thoughtful "New Home" gift, they all appreciated them, and as they send out cards, and other mail, makes for an easy way to let friends and family know their new address! The clear labels look nice on any envelope color! Since I do not care to write and the free return addr. 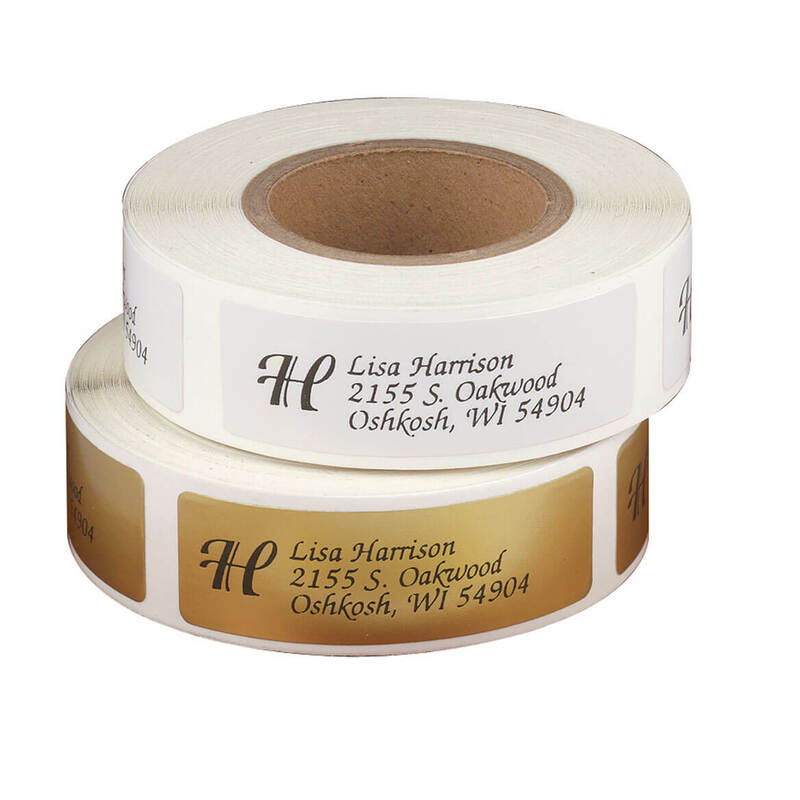 labels we receive are not exactly what we need this product is customized and can be used for all mail. I like them; they make your return address appear to be printed on the envelope. I have used these for many years. I get enough to last for a couple of years. need an expensive way to dress up envelopes. Needed these labels for the long name. Have been using these for YEARS and was running low. This is a re-order. I ordered this Item before and they were perfect. I couldn't ask for a easier way to order and pay for my purchase. I have purchased these before and I'm running out. I've purchased these before and liked them. We ordered the same one years ago. They lasted several years without fading or losing adhesive. Great product & great price. I have ordered these before and been extremely pleased with the product. Thanks. Clear labels will go on any envelope. I purchased one roll with block print for everyday use paying bills, etc. and one roll calligraphy for wedding invitations/RSVPs. I have ordered these before and have been impressed with the quality of the product and the speed of the order delivery. I prefer the clear labels. They are simple, plain, and easy to use. We use these all the time and they work very well on all color envelopes. We are running low so, we needed to reorder them! I love using clear labels to put on my Tupperware. They are so durable and last for years! Classic and neat. They can be business like or casual. Just what I wanted. I've always used these clear address labels. Love sending cards and letters and these labels make life easier! I had these from currents but I could not figure out how to preview on that sight. I googled clear pre printed address labels and recognized Miles K so i went there and in a few minutes ordered 500 with assurance. I use these for the back of my Avon order books, it is so much nicer looking than writing it all out. And I tried a stamp, but have to let all the books lay out to dry. It's 5/8 inches which may be larger than some of my return envelopes have space for...the clear label would solve this problem. I bought these labels for my daughter because she's too busy to stop and order them for herself. Now they show up on all the cards and correspondence she sends me. Yay! I like that they are centered. They are clear so the color of the envelope shows through. I got this to so I wouldn't have to keep writing my name every time I did letters & cards to family and friends. this will be easier for me. 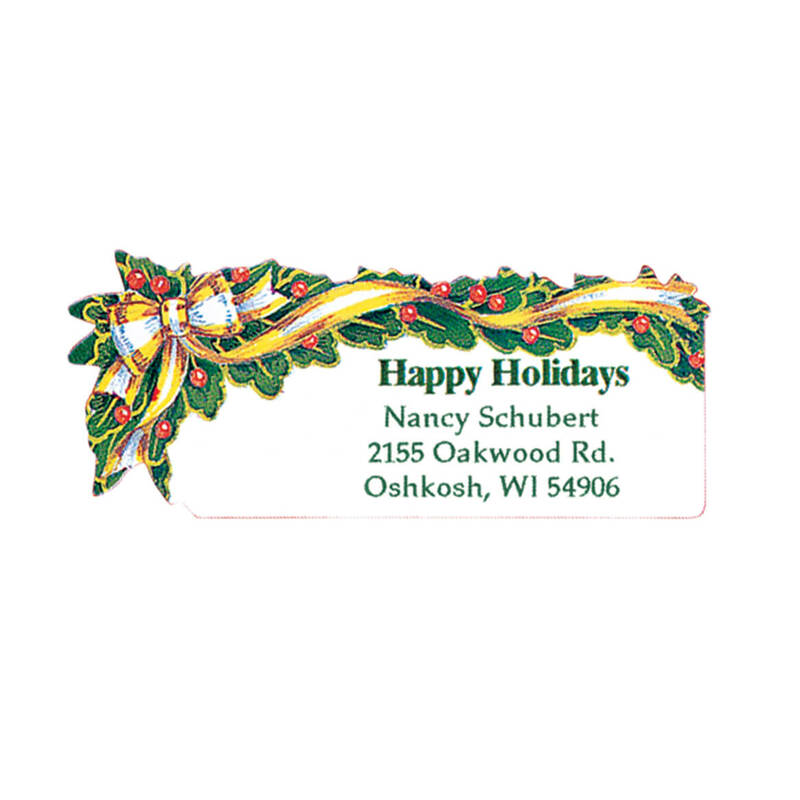 I use these clear address labels instead of signing all our names in the christmas cards. We are a family of 9 and we send out around 100 cards every year. Save the hand alot. I like the clear address labels. Have had these labels before and they are perfect! Great Prices and Reasonable Shipping Times. I needed clear labels with Last Name Only, and the price is reasonable. Do I have a choice of font ? BEST ANSWER: Thank you for your question. No, this label will be printed in the font style show in the photo. We hope this information will be of help to you. Sorry, I don't really remember....but I don't think so. BEST ANSWER: A very nice size. I use them on envelopes when paying bills. 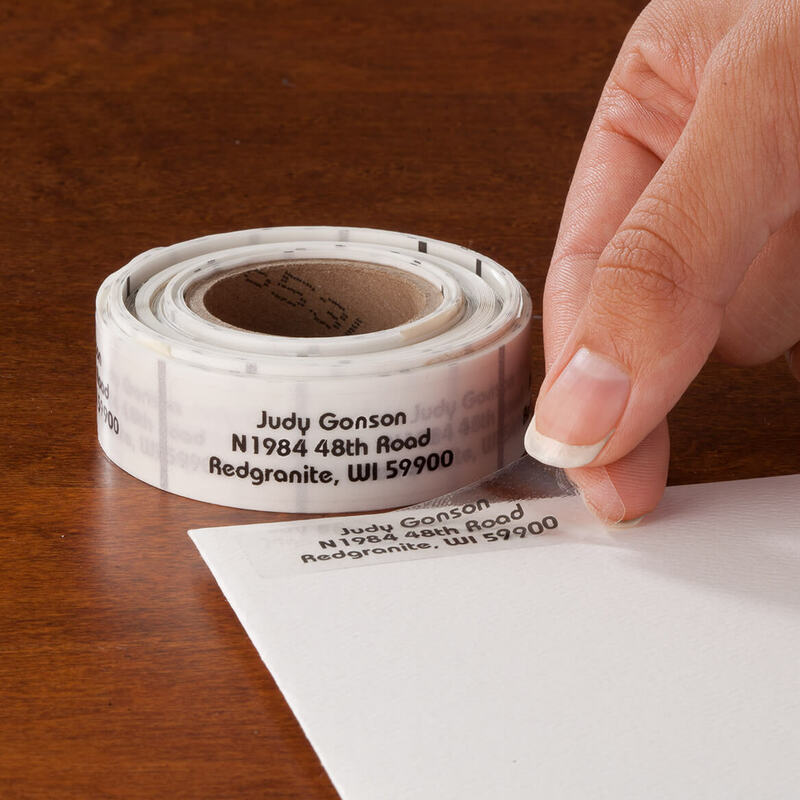 If I place the label so that my name is on the top line of pre-lined envelopes, the street and city and state are usually in the space provided for that without a line appearing to mark through the information on the label. I am not sure this is a good answer, what I am trying to say is that they fit nicely on envelopes and are easily read. Thank you for your question.The font is Block Bauhaus ITC (Italics) size 9 font. We hope this information will be of help to you. If there are only 3 lines in the address printing, the size of the font will be easy to read. I'm pleased with the way mine look! It was large enough to read easily. How to receive a catalog? BEST ANSWER: Thank you for your question. To receive a catalog you can put a request in on our website at the very bottom of the page and selecting "Catalog Request" or by contacting our customer service department. We hope this information will be of help to you. 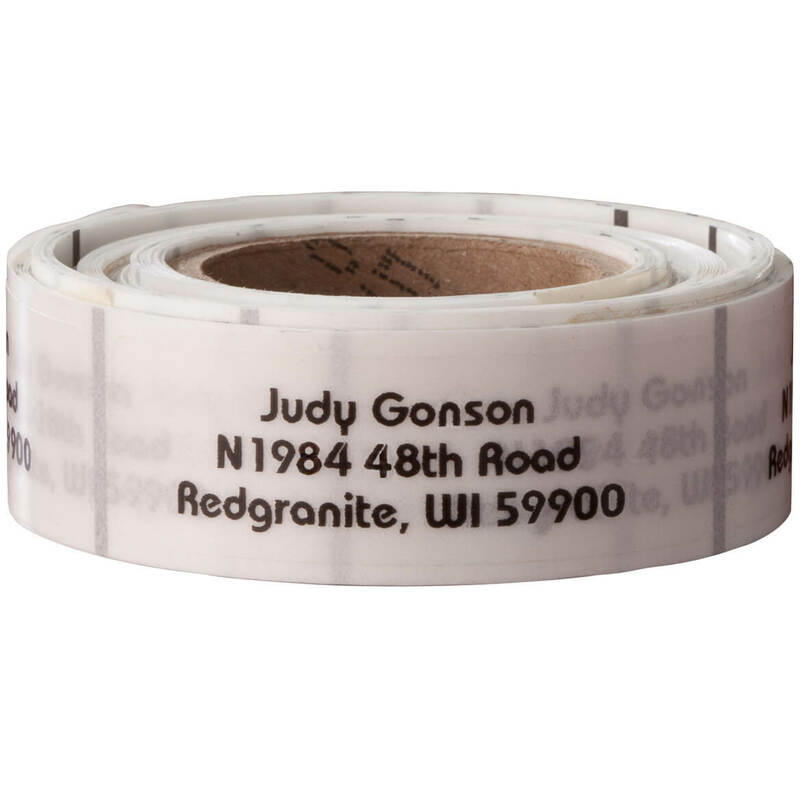 Can I order these labels by phone? BEST ANSWER: Thank you for your question. Yes, we are happy to take telephone orders, please call 1-800-546-2225 to place your order. We hope this information will be of help to you. Definitely! I have used these for years and love them! BEST ANSWER: Thank you for your question. Personalized orders take 6-10 business days to arrive. We hope this information will be of help to you. 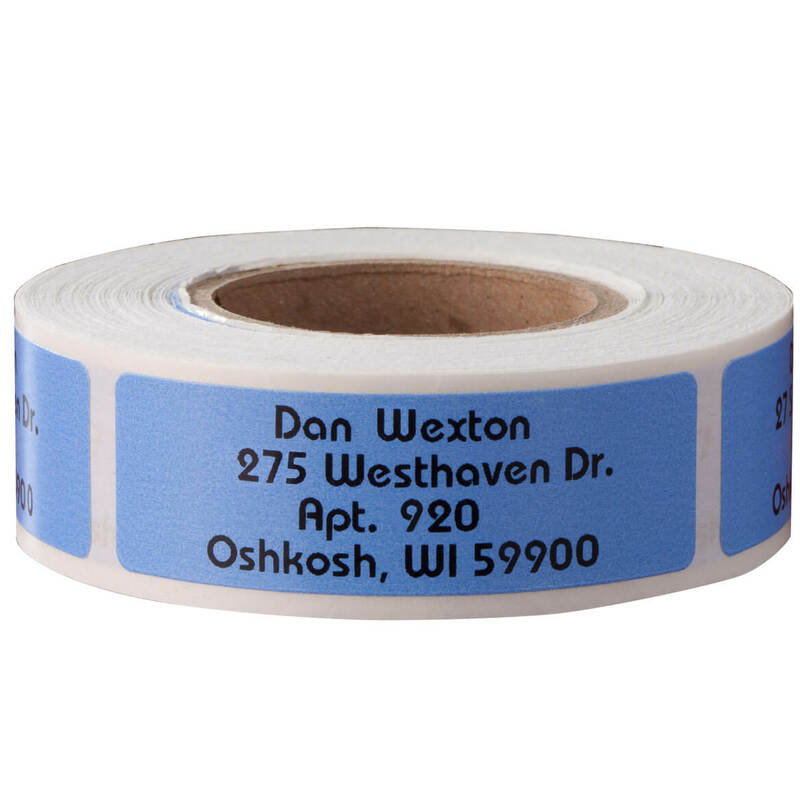 do you sell clear address labels in boxes rather than in rolls? BEST ANSWER: Thank you for your question. We do not sell boxed labels. We apologize for any inconvenience.